The Internet game industry has to shoulder its share of the burden in the fight against gaming addiction, according to the ruling Saenuri Party, concerned parents and professionals at addiction clinics. Since the beginning of the year, Saenuri Party lawmakers have proposed two related laws. The first bill, proposed by Rep. Shon In-chun and 16 other lawmakers of the ruling party in January, calls for the creation of a center to treat Internet game addiction. The establishment and running of the center would be funded with cash raised from game corporations. The tentatively named Internet game addition treatment charge would be set at below 1 percent of a company’s annual sales. The second and more heatedly opposed bill is spearheaded by Rep. Shin Yee-jin. In the proposed act, “Internet games and other digital media content” are categorized as one of the four major sources of addiction, along with alcohol, drugs and gambling, and subjected to tougher government controls. “The proposals are not focused on the industry but on helping the people who are suffering from (game) addiction,” an aide of Shon told The Korea Herald. He added that regardless of issues surrounding the use of the word “addiction” raised by the industry and opposition lawmakers, the proposed acts are designed to address a real problem. As with alcohol and other addictions, reports have linked compulsive gaming to increasingly violent and erratic behavior and criminal acts. In 2010, a middle school student murdered his mother and killed himself after an argument over his gaming addiction. In 2009, a couple addicted to Internet games allowed their daughter to die from neglect. “I don’t really know much about gaming addiction, but because I don’t know, I want the government to become more involved so that I will at least have somewhere to turn to if my family is affected,” a mother of an 11-year-old said, declining to be named. She said she limits her son’s access to the Internet partly due to the news stories about game addicts, particularly those involving teenagers. “To be honest, I don’t know if games can be addictive or the details of these laws, but I think that it’s only fair that the people who make games help pay (for treating game addictions),” she said. Aided by the world’s highest Internet penetration rate and the country’s high-tech electronics industry, Korea’s gaming industry has recorded growth rates that dwarf those of most other industry. Korea’s share of the international gaming market has also grown rapidly to account for 6.3 percent by sales last year. The figure for Internet-based games is 28.5 percent. Along with the industry’s growth, gaming addiction has become a growing social problem. 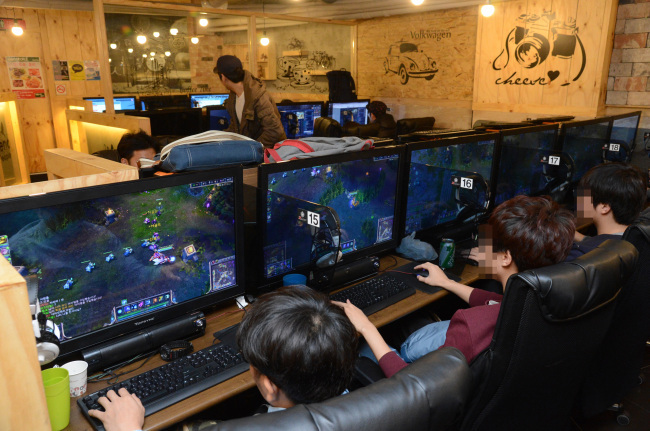 According to some estimates, as many as 10 percent of Korean teenagers are addicted to online games or are in the high-risk group. The National Information Society Agency estimates that teenagers addicted to Internet games generate between 4.27 trillion won ($3.89 billion) and 9.03 trillion won in direct and indirect costs on an annual basis. The estimates include cost of treatment and preventive measures, money spent to fund their habits and loss of time. Proponents of tighter government control also cite the scale of the game industry’s annual revenues. According to industry data, the Korean game industry’s domestic sales came in at over 9.7 trillion won last year with exports of nearly 3 trillion won. In addition, the Bank of Korea data shows that Korean gaming firms’ royalties came in at $680 million last year. In comparison, the figure for other cultural content came in at $120 million. “The bills must be legislated. Tobacco and alcohol makers are subjected to strict regulations, and so should game companies,” said Back Seung-yun, who runs the Game Clinic Center that specializes in helping teenagers deemed to be addicted to games. Back added that on average he provides five to six consultations for parents with game-addicted children on a daily basis, but that the number skyrockets during the school holidays. He went on to say that current measures in place to help game addicts are far too limited to have any real impact. “About 10 percent of teenagers are either addicted to games or are categorized as high-risk. The situation is much worse than that concerning alcoholics and drug addicts,” he said. The recent proposal by Rep. Shin Yee-jin of the ruling Saenuri Party to categorize Internet games as one of the four sources of major addictions ― the other three being alcohol, drugs and gambling ― is facing fierce opposition from those in South Korea’s game industry. The Korea Internet and Digital Entertainment Association published a statement on its homepage last month, declaring the death of the game industry in Korea. “The addiction bill, which defines games as an addictive material, effectively signs a death warrant for Korea’s game industry which is waging a lone fight in the world market,” the statement said. The K-IDEA kicked off an online petition against the bill on Oct. 28, which was signed by more than 253,000 people as of Wednesday. The so-called “addiction bill,” coming on the heels of other bills by Saenuri lawmakers calling for the game industry to fund the treatment of Internet game addicts, touched off a heated debate about whether Internet games can be defined as addictive materials that need to be regulated. Pundits point out that the concept of Internet game addiction is still relatively new and that there is not enough research to prove that Internet gaming is addictive in nature. Other countries are more cautious as opposed to Korean policymakers hastily pinning the blame on Internet games, according to Lee Dong-yeon, professor of culture theory at the Korea National University of Arts. “An addiction is very complex. The social and education surroundings (of a game addict) play much more important roles than the game itself,” said Lee, one of the most outspoken opponents of the addiction law. In the fifth edition of the Diagnostic and Statistical Manual of Mental Disorders, the American Psychiatric Association has identified internet gaming disorder as a condition “warranting more clinical research and experience” before it can be considered a formal disorder. “Most of the research in South Korea related to Internet game addiction is focused on statistics, and lacks clinical evidence to prove an actual correlation between addiction and Internet games,” said Kim Zon-dug, head of the Game Developers’ Guild of Korea. Saenuri lawmaker Nam Kyung-pil, who also heads the K-IDEA, said classifying Internet games as harmful materials can stifle the game industry. “South Korea’s game industry takes up more than 60 percent of its content exports. It is an industry which has a positive effect and is very effective in creating jobs,” said Nam. Rep. Jun Byung-hun of the main opposition Democratic Party, who had denounced Shin’s proposal as a “stuffy idea,” said that he felt “regretful” that the ruling party is pursuing excessive restrictions that contravene the very principles of free market. Proponents of the addiction law claim that it was never intended to target the game industry itself, but rather aimed to treat the string of problems stemming from game addiction. Lee said such an argument is not true and claimed that clauses 13 and 14 of the addiction law say the state is entitled to manage the production, distribution and sales of an addictive material, and can restrict its advertisement. Gaming professionals suspect that the attempts to regulate Internet games are already hurting the industry. CJ E&M, the biggest music and entertainment business firm in Korea, saw its shares plummet Monday after it was rumored to be pulling out of the video game business. Despite the company’s swift denial of the rumor, the stocks continued to drop the next day and only showed mild recovery on Wednesday. Stocks of local game companies including Gamevil, Neowiz Games and Wemade have been trending downward this month, which experts attributed in part to declining interest in game stocks in light of the controversy over the addiction law. Not only those in the gaming industry but also some policymakers oppose the addiction bill that will stigmatize gaming as something that’s as harmful as alcohol and drugs. The Ministry of Culture, Sports and Tourism revealed its opposition against the proposed bill on Tuesday, saying that gaming should be removed from the addiction list as no proof links it directly to addiction. “Internet and media content ― which are categorized as an addictive material in the bill ― are different from drugs, gambling and alcohol in that they are accessible to all people, including minors,” said an official from the Culture Ministry.